That's the challenge Mark Smeltzer and Wendy von Kalinowski of Sisters have taken on. 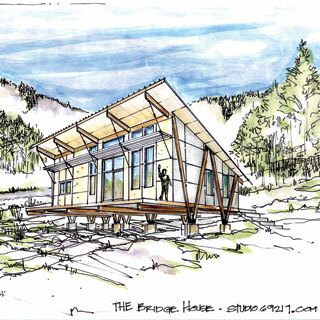 The principals of Studio 69217 LLC have entered the Living Aleutian Home 2012 competition with a project they call The Bridge House. The competition is designed to promote housing concepts that reduce the environmental impact of hauling materials thousands of miles, and the high cost of building and maintaining homes in the face of a strenuous climate. The housing concepts must also promote a high level of self-sufficiency water, sewer and electricity. There are restrictions on materials, even down to the PVC so commonly used in plumbing: It's made from fossil fuels and has to be shipped in. For Smeltzer and von Kalinowski, the project is, as Wendy puts it, a question of "How can we be more independent? How can we do better? It's this really big wheel that we're trying to turn." While The Bridge House is designed to meet the requirements of this particular challenge, its principles are widely applicable - including here in Sisters Country. As described in the narrative submitted to the challenge, "...The design of the home is elevated off the ground to allow for the non-disturbance of the site's natural topography, minimize foundation impact, promote positive air circulation, protection from stormwater flooding, limit rodent habitation, and provide potential storage under the structure without having to develop more space on the site." Smeltzer told The Nugget, "The house itself sits on a series of trusses. There are 10 footings, so that is the whole foundation." That feature is eminently adaptable to Central Oregon - and it saves significant excavation costs. "If you're in an area that's really rocky, you don't want to be hammering out a foundation for a month," Smeltzer said. The house is built around trusses that are exposed to the interior of the home. The walls and roof are made of structurally insulated panels. Panels are precut, reducing shipping volume and on-site waste. They are easy to assemble, reducing labor costs. The exterior of the walls is highly durable and essentially maintenance-free - a critical feature in a climate like the Aleutians, but also desirable in Sisters Country. The interior of the panels can be finished and does not require drywall (eliminating a cost and also the problem of containing drywall dust). The panels also offer excellent insulation, reducing heating and cooling costs. A house built in Sisters Country could be oriented to take advantage of natural light/heat (not a big factor in the Aleutians) and such a dwelling could be designed to be off-grid. The design, while modular, is flexible and a homeowner could get elaborate as he or she might wish. However, von Kalinowski notes, "It's not going to be your traditional, gabled house; that's not the approach of this." Studio 69217 is one of 104 design teams that submitted a concept for the competition. The challenge is part of an effort by the Aleutian Housing Authority to reduce fossil fuel consumption by 85 percent and to discover "whether ultra-efficient, environmentally sound homes can be developed affordably." Smeltzer and von Kalinowski will use the concepts they developed through the challenge to provide 21st century options for their clients in the Lower 48. This way, Studio 69217 is doing its part to turn that really big wheel toward a more sustainable future. For more information call 541-588-6092.